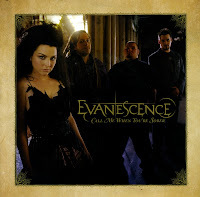 'Call me when you're sober' was released in August 2006 as the first single from Evanescence's second album 'The open door'. Frontwoman Amy Lee wrote the song together with guitarist Terry Balsamo. He joined the band when Evanescence's previous guitarist Ben Moody left. Amy Lee's sisters Carrie and Lori were credited as backing vocalists on this track. The single reached number 4 in the UK singles chart and peaked at number 13 in Ireland and Germany. In the Netherlands, the single rose to number 9. 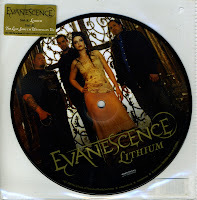 'Lithium' was the second single taken from Evanescence's second album 'The open door'. Peaking at number 32 in the UK and number 55 in the Netherlands, the single was reasonably successful. This picture disc 7" vinyl was the last vinyl release of the band so far.